Tesla is out with its third quarter shareholder letter, and the highlights include 33,000 vehicle deliveries expected for the year and the highest quarterly delivers ever, with 7,785 Model S sedans landing in driveways around the world. 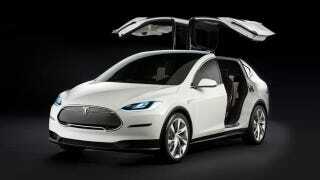 The lowlights: The Tesla Model X SUV has been delayed – again – now to the third quarter of next year. Despite the development and release of the dual-motor Model S, with deliveries beginning later this year, Tesla says it's decided to "build in significantly more validation testing time" for the Model X system. In anticipation of this effort, we now expect Model X deliveries to start in Q3 of 2015, a few months later than previously expected. This also is a legitimate criticism of Tesla – we prefer to forgo revenue, rather than bring a product to market that does not delight customers. Doing so negatively affects the short term, but positively affects the long term. There are many other companies that do not follow this philosophy that may be a more attractive home for investor capital. Tesla is not going to change. This is just the latest delay for the Model X, which was originally pegged for 2013, then pushed back to 2014, then late 2014, and now, the second half of next year. Currently, Tesla has Alpha prototypes of the Model X undergoing testing and is beginning to build the Beta versions. But these constant delays – although expected – confirm the same two things we've known: Building cars is hard and Elon Musk is a micromanaging perfectionist, for better or worse. It's also one of the reasons why Tesla launched the all-wheel-drive D now, rather than later, combined with these latest financials. Tesla's GAAP revenue was $852 million for the quarter, with a net loss of $74.7 million – nearly twice the loss it posted this time last year. The full investor letter is below. We'll be scouring it for more details and hopping on the investor call starting soon, so expect more updates.